We often get the question, “What makes a Fundrise eREIT worth investing in over the Vanguard REIT ETF?” It’s a fair question that we expected when we created the eREIT. The short answer is that Fundrise eREIT investments are lower in cost for investors than those of the Vanguard REIT ETF and also come with the potential for better returns — how our costs are lower than Vanguard requires a longer answer. In the long answer below, we examine how the traditional investment marketplace is organized in a way that places individual investors at the end of the value chain so that they earn the lowest return at the greatest cost. Fundrise, on the other hand, reorganizes the investment structure to give all investors direct access to better positioning in the chain, resulting in lower costs and potentially better returns. The Vanguard REIT ETF (VNQ) is an exchange-traded fund that owns shares of various real estate investment trusts (REITs). REITs are companies that invest in and own income-producing commercial real estate. Worth over $30 billion, the Vanguard REIT ETF is one of the largest public investment vehicles on the market. It owns shares in some of the largest publicly-traded REITs, which specialize in various types of commercial real estate. Some of the largest REITs in which the Vanguard REIT ETF owns shares are Simon Property Group (shopping malls, worth approximately $50 billion), Equinix (office buildings, worth approximately $34 billion), and AvalonBay Communities (apartment buildings, worth $25 billion). Large publicly-traded REITs like these offer the benefit of owning stabilized real estate — properties with high to full occupancy rates — which provide owners with regular monthly rental income. These large public REITs have gathered their assets over several years or even decades in both the private and public markets. As the investment moves through the value chain from origination to public investor, a long line of intermediaries, from Vanguard to private operators and developers, take cuts in the form of fees and expenses, for which investors ultimately foot the bill. On the surface, Vanguard charges no brokerage commissions and carries only a low investment advisory fee of 0.30%, which it reports to be lower than the industry standard of 1.02%. In addition to the advisory fee, Vanguard charges its REIT ETF investors an asset management fee of 0.11% as well as reimbursement of “expenses.” These expenses cover capital needed by Vanguard to operate its investment offerings, such as employee salaries, financial auditing and legal expenses. These are only some of the most obvious costs. Many investors make the mistake of believing that these are the only fees that they pay to own shares of the Vanguard REIT ETF, because they are the only fees that they see taken directly by Vanguard. But, in truth, there are additional fees and expenses charged deeper in the chain, paid to other players — and ultimately by investors — before the investments even reach the public. A large public REIT can charge many different types of fees, including management fees, development fees, leasing fees, acquisition fees, and property management fees to name a few. In public filings, fees are generally lumped in with other line items on an accounting sheet rather than delineated, which makes a true cost analysis out of reach for most investors. At the most basic level, REIT level management fees can total approximately 0.50% annually nominally reported, but this fee often does not include property level costs and fees reimbursed or buried in the property operations (i.e. : financing fees, development and construction management, lease administration, etc.). For instance, project sponsorship and marketing might be managed by an outside company owned by the REIT. Fees charged for these services would be separate from the REIT’s management fees. REITs have incentives to make sure their expense ratios are reported as low as possible. For example, a common scenario is an arrangement in which a food court inside of a REIT-owned mall is technically the property of an LLC owned by the REIT. The food court LLC manages the food court and collects the income paid by the restaurant tenants rather than the REIT itself. If these services are not owned or performed by the REIT itself, then their costs may not show up in the REIT’s nominal expense ratio. This keeps REIT expense ratios low in the point of view of the investor while enabling the REIT to charge for fees and expenses in a veiled manner. In addition to fees, REITs also have operational expenses, which further reduce take-home returns for investors. For example, REIT expenses for Simon Properties Group were more than $2.7 billion in 2016, with gross revenue approximating $5.4 billion and net income attributable to common stockholders totaling $1.8 billion. In 2016, expenses of the Simon Property Group REIT equaled 50% of the gross revenue. REIT managers also receive stock and stock options as part of their compensation. In 2016, the $13.2 million compensation of Simon Property Group’s CEO, David Simon, comprised over 70% equity. Remember, the fees and expenses described here only represent some of the costs of a single REIT. 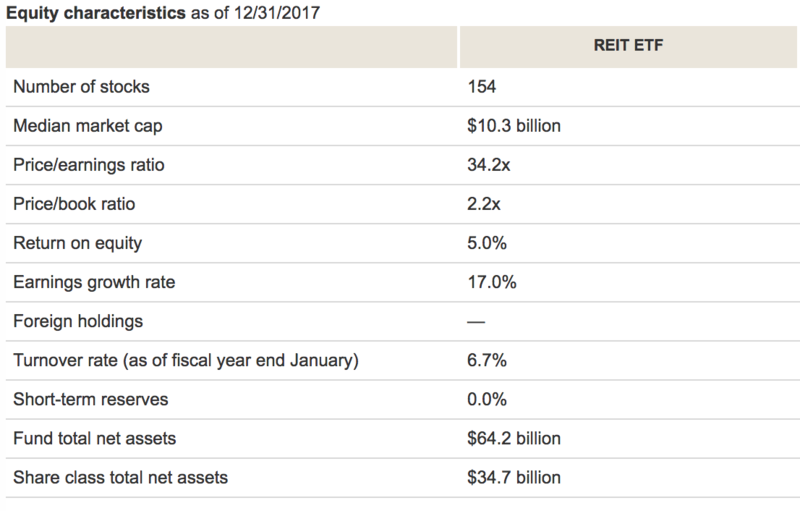 As of December 31, 2017, there were shares of 154 REITs contained within the Vanguard REIT ETF — and each charges its own set of fees and expenses. The Vanguard REIT ETF just aggregates shares of its selected REITs and adds an additional layer on top of them. Additionally, making each individual REIT and the Vanguard REIT ETF available to the public also comes at a cost. Investment banks typically charge a 7% underwriting fee and business owners and executives expect a substantial markup for moving their offering from the private to the public market. From the public market perspective, the REIT level appears to be the end of the line for the investment to the public market investor. That’s because they can’t see how the property was developed and sold into the public market. In fact, the value chain begins much earlier in the private market. Before a real estate investment can be traded in the public market, it must first be originated and developed individually, which predominantly happens in the private market. Large public REITs don’t typically originate and develop real estate themselves; they generally acquire fully stabilized real estate investments and manage them. In most cases, a REIT must acquire the property in the private market. When a REIT purchases property from the private owner, it pays a premium to the property seller, a value loss which is eventually passed on to the public market investor. Value creation in real estate is most often found at the development or renovation phase of an asset’s lifecycle. This is performed mostly by private equity funds, developers, or other private operators who are better equipped than public market firms, such as REITs, to pursue those opportunities. These firms benefit from local proximity to their investment properties and flexibility in investment criteria—both of which allow them to be nimble enough to invest in projects that have the potential to create value. First, being hyper-local to the chosen market allows the private firm to understand microeconomic trends within these markets neighborhood-by-neighborhood and block-by-block. This familiarity provides them with invaluable information, which is typically unavailable to non-local investors regarding when and where they should invest in growing or improving neighborhoods. Second, these private firms can pursue projects that fall below the radar of larger, public investment firms. These opportunities often include adding value to properties through property demolition and redevelopment, property renovation or the repurposing of an existing space. Private firms can also buy and hold properties to benefit from neighborhood appreciation. Once the private firm has added value to the property and turned it into an institutional-quality asset, it is ready to sell to prospective buyers. When determining a sale price, the developer bakes in its cost of acquisition and development, its fees to the firm (such as overhead, management, and sales fees), and a market return to sell the property to a REIT or other institutional investor seeking stable, mature assets. You may be thinking that you could just invest at the private level and bypass the extra layers of operators. However, access is generally limited to high net-worth individuals and institutional investors; in practice, minimum investments are generally seven figures for high profile funds. Private equity fund clients also typically incur a steep “two and twenty” fee structure where they are charged a 2% annual management fee and an additional 20% fee on any profits that the fund earns past a certain hurdle rate. The public market investor does not pay fees directly to the private equity firm or developer. Instead, they indirectly absorb the costs incurred in the form of a higher-priced investment. In other words, they pay a public market premium — a 20% to 30% markup for the efficiency and liquidity of the public markets. Here’s a demonstration of the public market premium: Blackstone, a private equity fund, listed its company, Invitation Homes, a portfolio of single family rental homes, on the New York Stock Exchange. Share prices of Invitation Homes rose and returns fell immediately upon moving from the private to the public market. 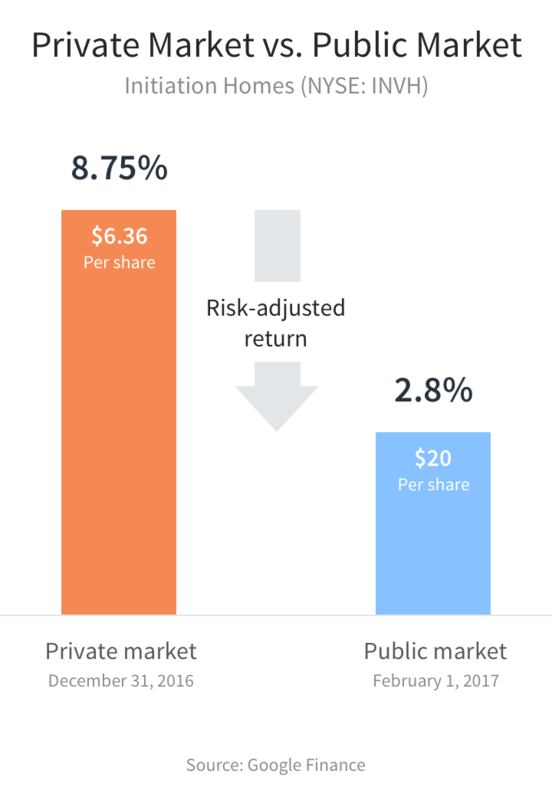 Public market investors paid higher costs and earned lower returns for the same investment than investors who purchased it on the private market due to the liquidity premium. In the model used by the Vanguard REIT ETF, public market investors naturally inhabit the last link in the value chain, unable to pass on the costs they’ve inherited from earlier players in the chain. They trade in the very transparent and efficient public market where they see only the final price, fees and expenses. As the end investor, they bear the burden of all the steps that came before and they reap the least rewards from the investment. Had they been able to access the investment at an earlier stage, they most likely would have been able to earn better returns. By the time that a real estate investment opportunity moves from the private market player at the beginning of the value chain to the individual investor at the end, its earning potential has diminished for the end investor, as it has already incurred several sets of fees, expenses, and markups. Overall, the individual investor at the end of the value chain buying shares of the Vanguard REIT ETF buys at the advertised retail price — not at the wholesale price that is available earlier in the supply chain — earning the lowest return at the most inflated investment price. In general, markets favor investors earlier in the value chain. While the Vanguard REIT ETF offers investors wide exposure to multi-billion dollar REITs mostly comprising mature real estate, those same investors are positioned to reap the least reward in the public market arrangement. Where public market investments rely on several financial organizations to perform various services from acquisition and development to offering diversified portfolios of REITs, Fundrise uses technology to consolidate these functions and reduce the number of intermediaries in the value chain. Fundrise has created a new investment structure that ultimately positions the individual investor to earn better returns at lower costs. How? Fundrise originates and manages its own investments, which it offers directly on Fundrise platform, cutting out middlemen, such as brokers and their fees. Rather than purchasing a real estate investment at the retail level — which is bloated with the inefficiencies and premiums of one financial institution after another — Fundrise offers a vertically-integrated system, directly connecting real estate investment opportunities to investors. By streamlining these processes, Fundrise and the eREIT model offer investors more transparency, lower fees, and potentially better returns than the Vanguard REIT ETF. The Fundrise eREIT is a professionally-managed public non-traded REIT that invests in and owns a diversified portfolio of real estate. A Fundrise eREIT invests in debt and equity real estate opportunities that match each eREIT’s particular goals. For example, the objective of the Income eREIT is to earn consistent cash flow for investors. To achieve this, the Income eREIT has invested in more debt investments than equity investments. Because Fundrise offerings are not publicly-traded, they behave differently than public REITs. While public REITs provide daily liquidity, the Fundrise eREIT can offer limited monthly liquidity. By opting out of daily liquidity, which goes unused by most ordinary investors — a logical decision for a long-term investor — Fundrise eREIT investors avoid the returns-shrinking liquidity premiums experienced by public market investors. Additionally, as a non-traded REIT, the Fundrise eREIT is less correlated with the fluctuations of the public markets, thereby providing greater diversification to an investor’s portfolio. This means that when stock market values move, Fundrise investments are less likely to move with them, providing insulation against future market volatility. The Vanguard REIT ETF, on the other hand, is publicly-traded and the value of the REIT ETF and its underlying assets are far more correlated with the performance of the stock market. Instead of following the traditional public market path, Fundrise leverages its integrated system and new regulations to originate assets in the private market and distribute them online directly to the public. In other words, the differences between investing with Fundrise and Vanguard are similar to buying shoes directly from a manufacturer online vs in a retail store. Investing with Fundrise is similar to buying shoes direct from the manufacturer online at the wholesale price whereas buying a Vanguard REIT ETF is similar to buying shoes in-person at a traditional shoe store at the retail marked-up price. The Fundrise investment model is set up differently than the Vanguard ETFs from beginning to end. At the beginning, Fundrise sources, underwrites, originates, negotiates and closes all of its own investments. This means that Fundrise finds all of its investments, such as property for development, buildings for renovation, or loans directly to developers. In the Vanguard REIT ETF model, this work is performed by many other players, and usually in layers. While a private market operator will generally mark up the sale prices of its properties, as explained above, Fundrise directly funds investments in the private market on behalf of its investors. This places the investor much earlier in the value chain with systematic costs and higher potential returns; it saves investors the cost of the liquidity premium and other many fees and expenses. For the origination and acquisition of real estate investments, Fundrise charges investors 0% commission or fees. Like large individual public REITs, Fundrise manages the ongoing operation of the real estate and loans contained within each eREIT. Unlike a large public REIT, Fundrise continuously originates new loans and acquires new properties for each eREIT. Sourcing, underwriting, and closing new debt and equity real estate investments are not common practices of public REITs. These demanding and high-value services are much more commonly characteristic of a private equity fund or other private market players. For example, Fundrise leverages technology to review thousands of prospective investments annually and invests in only a few dozen. Additionally, unlike public REITs, which act as stewards of pools of stabilized, mature real estate, Fundrise focuses on individual unstabilized real estate investments with potential for value creation. The management of a property earlier in its life cycle typically requires greater attention. Most of the investments Fundrise has made include value creation through entitling a property for development, ground-up construction, or renovations. Investing in an asset before moving from unstabilized to stabilized gives the investor the opportunity to benefit from higher potential appreciation than investing in an already-mature asset. The real estate investment trust designation of the eREIT does not equate the services or value creation offered by the eREIT with that of a public REIT — it simply allows Fundrise to pass at least 90% of the eREIT’s earned income to investors without paying taxes at the corporate level. Fundrise investors can invest directly into an eREIT and only pay an 0.85% asset management fee at the eREIT level. Investors who want to diversify across multiple Fundrise investments, including eFunds, can do so through one of the investment portfolios. For example, rather than choosing one eREIT or more, investors can invest in the Starter Portfolio with a minimum investment of $500. For this service, investors are charged an investment advisory fee. Like Vanguard, Fundrise is a registered investment advisor which offers portfolio management and advisory services. In fact, Fundrise is the first-ever online real estate advisor. Using this option, Fundrise allows investors to build portfolios composed of various Fundrise offerings, providing diversification across a wide range of real estate investments. 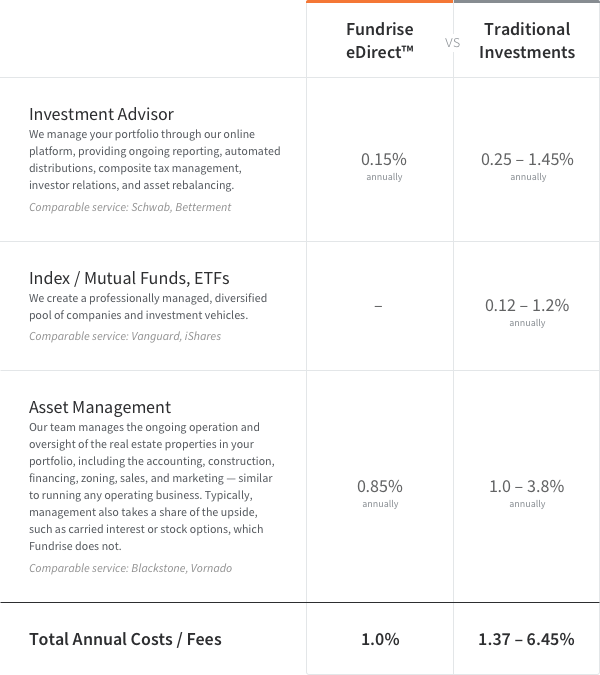 Fundrise manages this portfolio allocation through the platform and provides ongoing reporting, automated distributions, composite tax management, and asset rebalancing. For this service, Vanguard charges its investors a 0.30% annual investment advisory fee. Fundrise charges half of that — just 0.15% annually. Only in a skin-deep analysis does Vanguard appear to offer a lower-cost option than Fundrise. When analyzed more thoroughly, an analysis of Vanguard reveals a broad swath of fees and costs innate in the public market investment system, which are absent from the Fundrise investment model. Vanguard itself charges its VNQ customers a 0.30% advisory fee, a 0.11% asset management fee, and other expenses totaling 0.13% — altogether costing investors 0.54% of their VNQ portfolio. 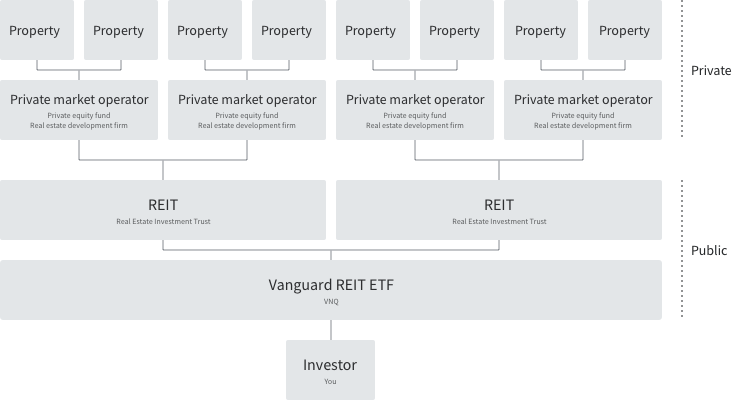 Before the REIT ETF investment opportunity reaches the individual investor on the Vanguard platform, each individual REIT comprising the portfolio has taken their cut; and before that, private firms who developed and sold their investment into the public market have taken their slice from each individual real estate investment, diminishing the total value available to the end investor. In the end, investors receive a real estate investment that is highly correlated with the broader public market, carrying a diminished yield, which is currently annualized at 4.38%. Fundrise, on the other hand, consolidates real estate and financial functions, with Fundrise’s own professional teams performing all of the work of private firms, REITs, and an investment advisor, such as Vanguard, all under one roof. Because Fundrise works directly with real estate developers and operators, there are no intermediaries to charge added fees and expenses. This direct market organization cuts down on fees and expenses and better positions the investor within the investment system improving their earning potential. For this direct process, Fundrise charges its eREIT customers a 0.15% advisory fee and a 0.85% asset management fee. The Fundrise Income eREIT offers greater diversification for a public portfolio consisting of stocks and bonds, because it is less correlated to the stock market. It also earned a declared a 10.5% annualized dividend for Q3 2017. We believe that the straightest path is the best strategy for our investors: it requires the least amount of time and money from the end user and offers the greatest potential upside. This sort of approach is not the norm in the investing industry, because it requires more responsibility and a consolidation of expertise from the financial institution itself. But as a model that puts the investor first, it offers the maximum benefit in the long run and much-needed innovation to the investment market. The changes to the tax law have positioned real estate investors for potential, significant new tax advantages, especially taxpayers who invest in real estate through REITs.